Spring is finally here, and you can see the signs everywhere! 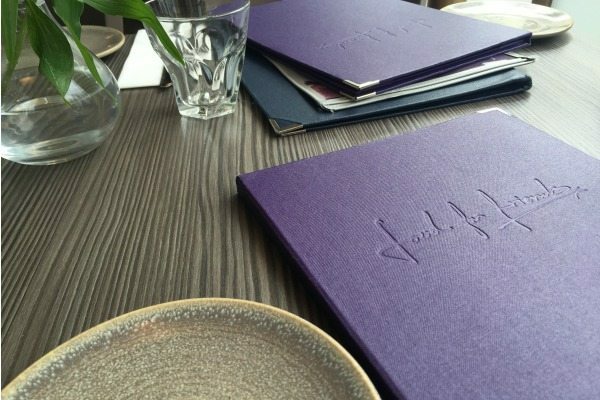 Daffodils are blooming, the days are getting longer, and all of Brighton’s best restaurants are bringing out their fresh Spring Menus, hallelujah! I love the change in seasons, it’s one of the many reasons why I moved here from sunny California. My favourite part is the way it inspires our brilliant Brightonian chefs to change it up with the season’s new crop of fruit and veg, and get creative again, I absolutely love it! 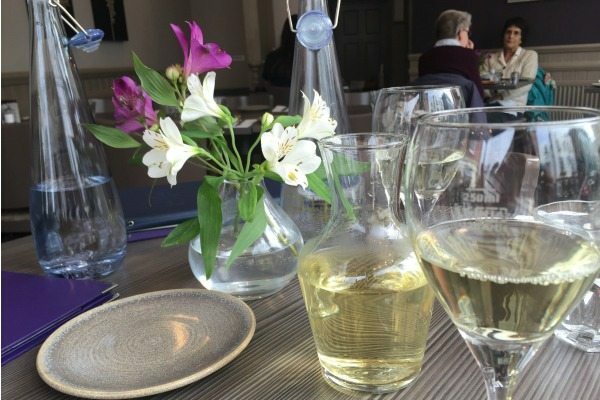 Recently I was invited to lunch at a wonderful Brighton establishments that is very close to my heart, and is one of the best at making the most of the freshest ingredients, Food For Friends. When I first moved to B-town my first job was waiting tables at Food For Friends, and I have been a massive fan ever since. When I first arrived it was like stepping into my living room, so comfortable and welcoming just like I remembered. The whole restaurant seems lit from the inside. The giant windows let in the sun most of the day and if you are in the right seat you can catch a tan while sipping prosecco in their dining room. The artwork is tasteful, and the decor is minimal and contemporary, with clean lines that allow the restaurant to transition from casual lunch to sophisticated dining effortlessly. Their whole idea of sharing food with friends describes the atmosphere perfectly. 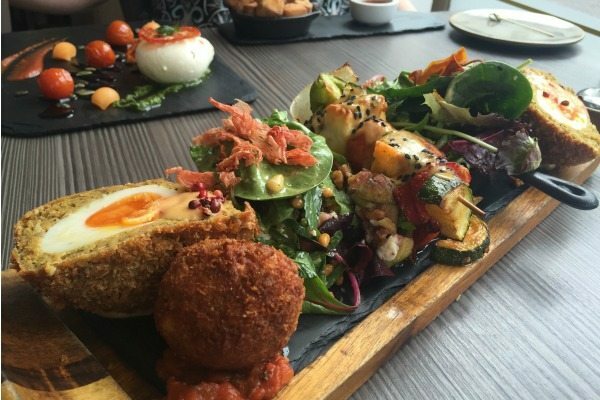 As we sat down for lunch our lovely server explained their new sharing platter option that allows you to sample several small plates and share a carafe a wine, absolutely ideal for a lunch date. It was clearly quite popular as three other tables in the dining room had already ordered this and it look fantastic, so we took the recommendation. 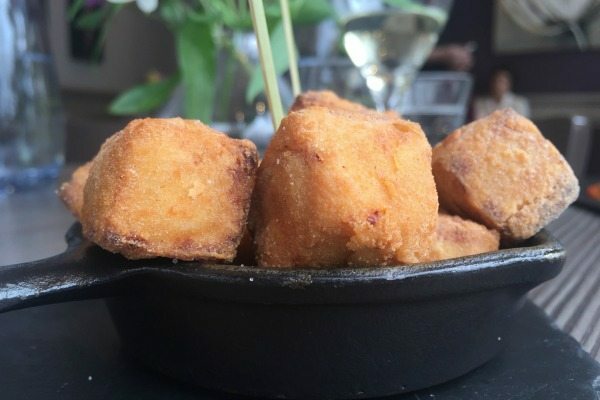 Being a Food For Friends regular I couldn’t come without having my favourite starter, the crispy tofu, and my friend suggested that we also try the Burrata cheese, it was going to be a tonne of food, but isn’t that what long lunch dates are all about?! While we waited for our food we enjoyed the sunshine and the people watching, and also cast an eye over the dinner menu which looks excellent. As I mentioned before Food For Friends is constantly trying new ideas, and their new open ravioli and double baked souffle both sounded really exciting which had me making mental notes for date night. When lunch arrived we instinctively brought out our cameras, as do most diners at Food For Friends, because each plate is just beautiful. The dishes are created with care and thoughtfulness to showcase each element of the dish and designed to give the diner a feast of the senses. As always their presentation was colourful and creative with a bit of flare, and everything looked delicious. 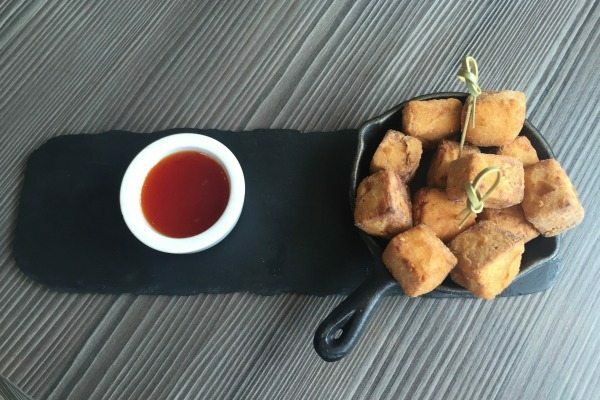 The crispy tofu is a classic Food For Friends dish and has a texture that you would never expect; it’s light and crispy, full of flavour, and is so more-ish that often times you need to order a back up if you are sharing. Next was the mild and creamy Burrata cheese, served with a semi-dried tomatoes, honeydew, basil pesto, balsamic reduction, and pumpkin seeds for crunch. 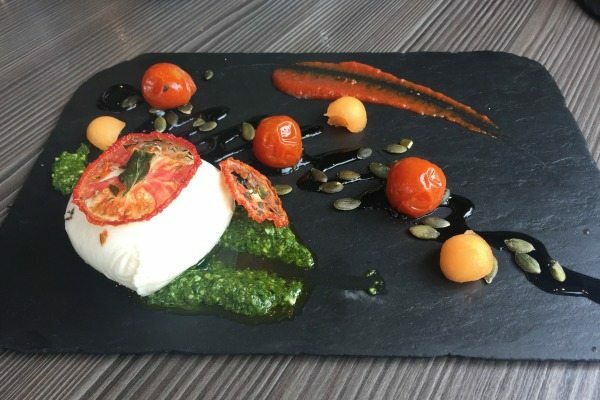 Similar to buffalo mozzarella the Burrata was a creamy compliment to the salty tart balsamic glaze and the fresh and sweet melon, a lovely combination of two classic Italian starters and it was a perfect spring time addition. Now for the main event, the Sharing Platter! If you have ever read any of my other reviews there is clear theme, I love sharing. I mean what better way to try a bit of everything and also have a great topic of conversation? Plus you never have to worry about food envy, because everything is up for grabs. With the Food For Friends platter you get enough to share between two, and the portion sizes of each of the five elements are very generous. The platter comes two very different fresh spring salads. The first is a super food quinoa, avocado, and feta salad, which is tossed in an agave, lemon, and chili dressing and topped with sweet potato crisps and seeds, fresh, delicious and oh so healthy. Next is the Fig, basil, and smoked ricotta salad with a tangy mustard dressing and topped with pine nuts and pickled ginger crisps. I absolutely loved the crisps they were such a wonderfully intense ginger flavour something I had never really experienced, and they gave a natural kick to the dish which was outstanding. The Grilled Halloumi and paprika vegetable skewers were excellent too, they had just enough the right amount of crunch and char, and they were drizzled with an earthy coriander and tahini dip, which was so good that I wish I had asked for a pot of on the side to dip everything in. Next up was the warm goats cheese and pea arancini which was crispy on the outside with a creamy centre filled with goats cheese, peas, and fresh mint which I really enjoyed and thought were cooked perfectly. The arancini were filling but not heavy and was just enough to have me wanting more. 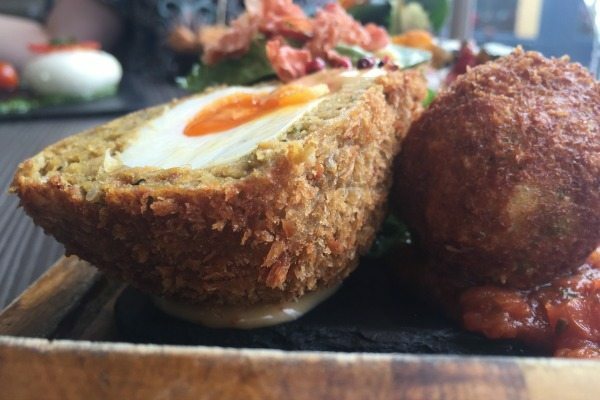 Last but not least was my favourite element, the spiced scotch egg. The egg was cooked a perfect medium with a runny yolk and a firm white, and then was encased in a curried chickpea and carrot mixture that was rich and flavoursome and gave it a smooth creamy texture. The outside was then deep fried to give it plenty of crispiness. 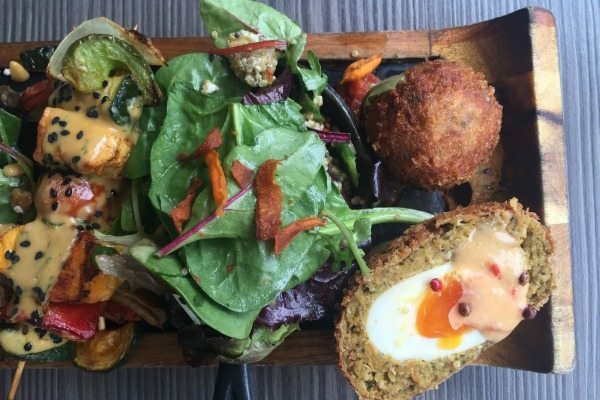 All in all it was a wonderful sharing option and had all the elements that one would want from a fresh spring menu; light salads, rich arancini, creamy egg, and grilled halloumi. Although it was a tonne of food we managed our way through it and even saved room for dessert. 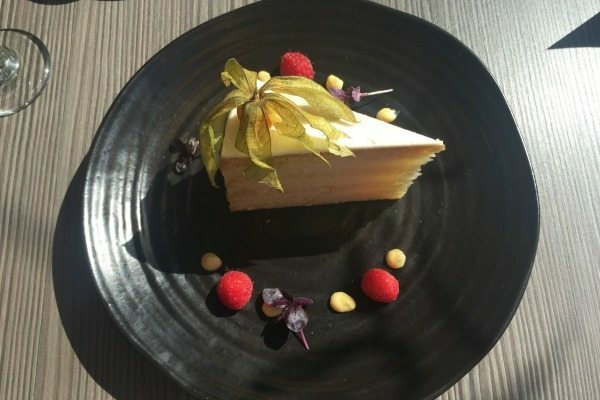 After such a filling lunch we decided to share the dairy free lemon and almond cake with citrus soya cream. 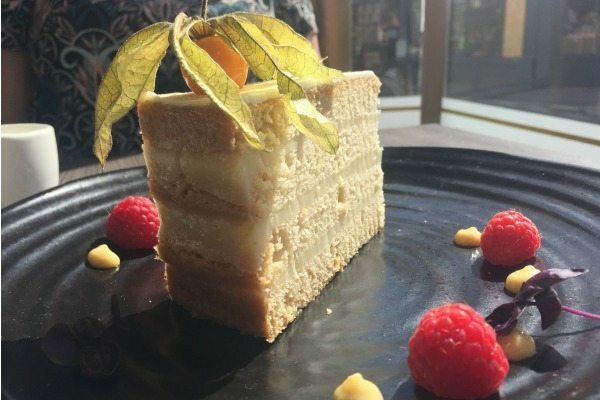 The cake was rich and moist with a lovely dense texture and the citrus creme on top was light and citrus brought out the richness of the almond flavour. Although we were stuffed from lunch we made short work of such a wonderful dessert. 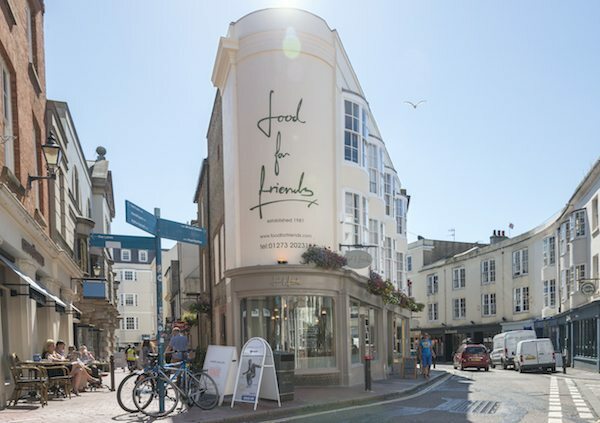 Food For Friends is one of my favourite Brighton restaurants as they take just as much thought and care into their desserts as every other course. They would never dream of serving anything less than wonderful and even though they cater to many dietary needs they will never compromise the quality of the food. As always an absolute pleasure to visit and dine, and I will continue to recommend Food For Friends to any and all looking for excellent service, outstanding food, and a friendly welcoming atmosphere. 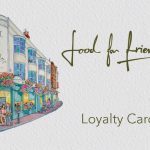 Food For Friends has recently introduced a loyalty card to give something back to their customers. How does the following sound? Find out more and get your hands on a loyalty card.